There are so many different colour choices for wedding flower designs and the choice can be for single colour shades, multi-coloured celebrations or colours to suit the season. Spring floral colours generally tend to reflect the blooms available this time of year in yellows, blues and white while summer presents the option for more colours including pinks and purples. Wedding florists will have plenty of ideas for designs and flower choices to suit any taste and style – from classic and elegant to quirky and modern. Here’s some inspiration for flowers in popular colours for a spring or summer wedding. White. White is often a prominent colour at weddings – symbolising purity and beauty, especially in the bridal gown. Although particularly popular for winter wedding decorations, white flowers are also beautiful choices for weddings in spring and summer. They can be stand-alone bouquets and decorations, or incorporated into bridal bouquets and other wedding flower arrangements to complement and enhance brighter colours like red and purple. White flowers like roses and lilies make wonderful showpiece blooms, while more delicate flowers like baby’s breath and lily-of-they-valley are perfect complements to harmonious bouquets and arrangements. A teardrop bouquet of calla lilies is an elegant, understated choice while white roses can complement pinks and greens in a romantic rose bouquet. Red. The colour of passion and love, red is a bold and striking choice for wedding flowers. Although particularly popular in winter, as in this crimson rose and berry bouquet red can be suitable for any season. Spring and summer red blooms to choose from are daisy-shaped gerberas, tulips, carnations, anemones and roses. Red blooms harmonised with pink flowers makes for a particularly romantic look, while a rich, dark red bridal bouquet for red roses will looking sumptuous and striking against a white wedding dress. In the winter, red perfectly suits a Christmas- themed wedding and flowers can incorporate winter greenery like holly and ivy. Yellow. Yellow flowers for bridal bouquets and floral wedding decorations are perfect for spring and summer weddings. Symbolising happiness and joy, these cheerful blooms will add colour and brightness to décor and make perfect complements to bride and bridesmaid’s dresses. Roses, lilies and gerberas are all available in bold shades, while more pastel shades of daffodils and hydrangeas are also an option. Yellow blooms look beautiful pared with white flowers and juxtaposed with sprigs of greenery to really make the colours pop. Yellow tulips make for show-stopping wedding centrepieces and white and yellow roses with ivy make for beautiful brides flowers. Blue. While rarer finds, blue flowers make unique additions to wedding flower designs – symbolising inspiration, creativity and hope. They also account for the traditional ‘something blue’ for good luck! 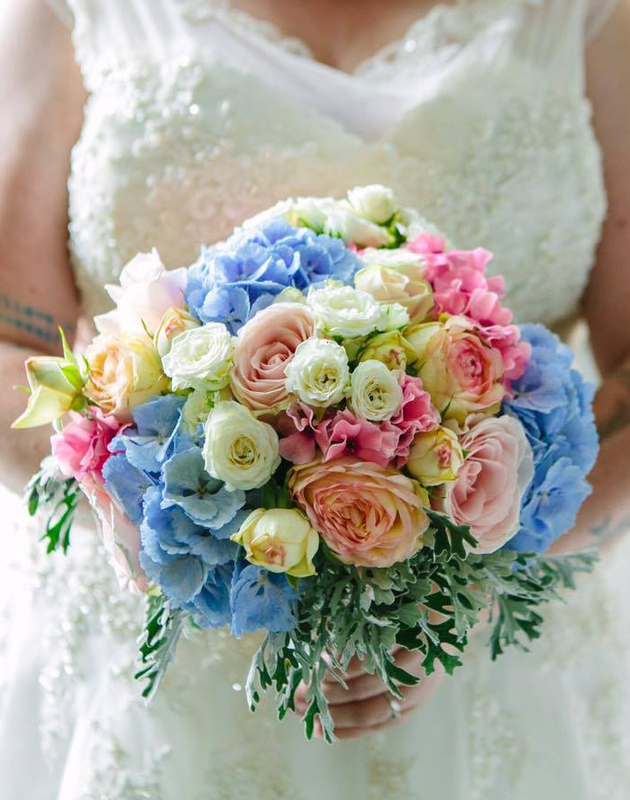 Aqua blue wedding flowers complement white blooms in arrangements, while deep blue flowers will complement white and yellow shades and are harmonious with greenery. For deep blues consider anemones, roses and cornflowers, and for pastel spring shades there’s the choice of hydrangeas, hyacinths, forget-me-nots and irises. Purple. Purple has long been associated with richness and royalty, so it’s no surprise this regal shade is popularly requested from bridal florists for wedding flowers in bouquets, reception arrangements and centrepieces. Purple flowers to choose from are anemones, sweet peas, delphiniums, stocks, calla lilies and rose. Shades vary from very pale to deep shades, to suit all tastes and styles. Purple blooms can be anything from dramatic to pretty, traditional to rustic. Purple orchids and pink roses make an exciting bouquet, while pastel mauve roses are adorned with white freesias for true romance in a more subtle arrangement. Add to white floral bouquets or juxtapose with orange or yellow blooms for something more striking. Pink. Pink wedding flowers are particularly popular in spring and summer and create the perfect feminine, romantic look. Pink blooms are very versatile and can be made prominent in white arrangements or complement red floral bouquets and wedding centrepieces. Pastel pink shades are harmonious with mauves, whites and blues in a romantic floral centrepiece incorporating roses, hyacinths and hydrangeas. There’s plenty of choice of style and texture when choosing pink flowers for weddings: from classic roses to exotic orchids and cheerful gerberas. More rustic choices are sweet peas, stocks and delphiniums which to be incorporated into wedding flower designs and bouquets. Coral wedding flowers such as roses and ranunculus are lovely, understated shades that work well in bouquets of white and cream flowers. Orange. Signifying happiness and joy, orange wedding flowers make lovely additions to summer and autumn decorations and bouquets. Whether pale, pastel shades or richer colours like burnt orange wedding flowers, this colour is surprisingly versatile and suits many looks and tastes. Dahlias, chrysanthemums, gerberas and roses are all flowers that come in shades of orange. 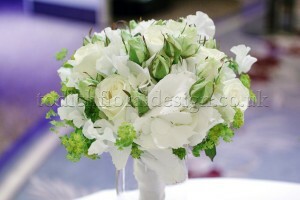 They work very well with pale pinks, white, creams and greenery in bouquets. 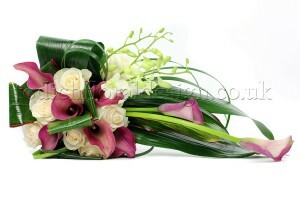 Orchids and calla lilies are alternative, more exotic choices that make great wedding buttonholes and corsages. Orange is ideal for autumn when the abundance of fruits, flowers and vegetables makes for a celebratory season perfect for weddings. Green. There are pale green shades of hydrangeas and tulips (green hydrangeas can complement pink and cream roses) but a green bridal bouquet tends to be about white blooms complemented by green foliage or wedding floral displays made prominently of greenery: vines, leaves, ferns or more modern plants like succulents which can be used to create quirky and unique arrangements. The original wedding bouquets were made up of fragrant herbs to keep evil spirits away, so a green bouquet can be in keeping with an old tradition. Rosemary, sage and lavender are lovely choices and will perfectly complement full white bridal flowers such as roses and peonies. Succulents and mini potted plants make delightful place settings and wedding favours, while greenery such as branches and vines can be used to create a woodland wonderland look. All the colours of the rainbow awaits when choosing floral designs for the perfect wedding, and there’s no end to where your inspiration could take you! To ensure your wedding bouquet looks its best all day, always choose flowers in the peak of their season and autumn is the perfect time for bright, vibrant colours and soft creamy whites! Autumn probably conjures images of rich reds and golds but the autumn floral harvest goes well beyond that. 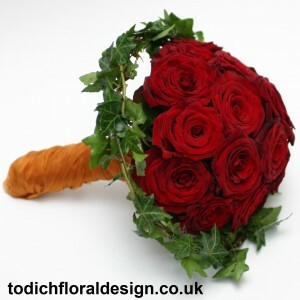 Most brides stop at the beautiful teardrop of the rose bud or the classic sunny shape of a carnation but choosing a more unusually shaped flower can create an original and unique bouquet. Try a few arum lilies or orchids to create a something delicate and sophisticated. A bunch of yellow narcissus makes for a wonderfully delicate and pretty posy and a bold bunch of hydrangea gives a full celebratory shape. Autumn flowers are perfect for traditional and â€œromanticâ€ weddings. All the favourites are available. The detail and beauty of the snap dragon can make an unusually pretty bouquet and of course, rose lovers are spoiled this time of year. For a simpler wedding, Autumn is the perfect time to create a naturally beautiful wild flower themed bouquet using flowers like scabious or consider a loosely tied bunch of spectacular sunflowers for a simple but striking look. Try a few blood red zantedeschia for a dramatic and eye catching bouquet for black and white themed weddings (which are so fashionable these days) the zantedeschia or even red tulip or rudbeckias bouquet is every photographers dream! The most exciting way to make a beautiful bouquet fragrant and romantic is to add a few herbs. Many herbs not only smell and taste enticing but also sport delicate soft leaves or even a bold silver hue. Sage is readily available in autumn and has both beautiful delicate purple flowers and green and silver foliage. The aroma will add a touch of romance on your big day and forever trigger wonderful memories.